Sanjoy Roy is the Managing Director of Teamwork Arts which he established in 1989, and has offices in several cities across the world. Teamwork Arts produces TV shows, Films and documentaries, and also designs and produces 23 annual Arts Festivals across 21 cities in 13 countries. He has directed and produced over 1000 hours of a wide range of films and television shows, including drama series, game shows, newsmagazines, and lifestyle programmes. He received the National Award for Excellence and Best Director, for the film `Shahjahanabad The Twilight Years’. 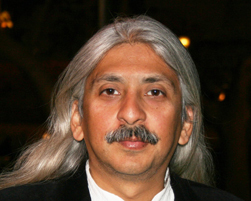 He is currently the festival director for Shared History Festival in Johannesburg and Durban, Eye on India – Chicago and Seattle, Celebrating India – Jerusalem and Tel Aviv and is the producer of the Jaipur Literature Festival, META – The Mahindra Excellence in Theatre Awards, Kala Utsavam – Singapore, Kahani Festival, India and The Ishara International Puppet Festival. He has produced or directed over 50 theatre productions, which have toured across Austria, Germany, Singapore, South Africa and UK and has won a number of awards including the Herald Angel Award and the Spirit of the Fringe at the Edinburgh Festival. His latest production `Guide’ based on RK Narayan’s novel and film premiered this summer to excellent reviews. An advisor for arts for numerous governmental organizations across the world, he designed and directed the closing of the Commonwealth Games Arts Festival 2006 – Melbourne & was an advisor to The Kennedy Centre’s, Maximum India Festival. He is the founder trustee of Salaam Baalak Trust working to provide support services for street and working children in the inner city of Delhi and the Ishara Puppet Theatre Trust.